Pan Asia Bank brought you a special interest rate of 12.5% PA (13.03% AER) for the 4 month fixed deposits. 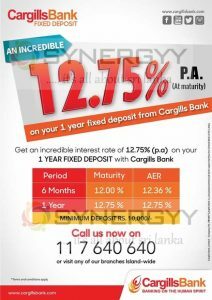 Cargills Bank brought you a special promotion of 17% p.a interest rate for 5 Years fixed deposits with an AER of 13.09%. at present this is one of the best interest rate available in market for 5 year fixed deposits from Banking sector. 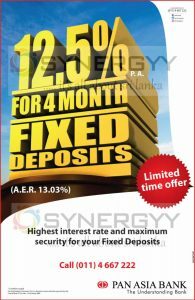 And the Cargills Bank also offers 12.75 % per 1 Year Fixed Deposits and 12% per 6 Month Fixed Deposits. NDB Bank welcome you to their newly refurbished branch at Nawam Mawatha,the Branch with modern digital and convenience banking, where you can avail yourself of superior banking and financial services as well. 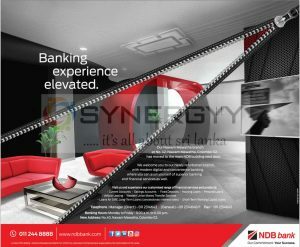 Visit NDB Modern Digital Banking centre and experience customised range of financial services and products of below. 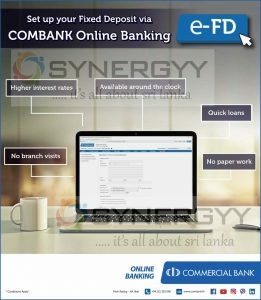 Banking Hours: Monday to Friday – 9.00 a.m. to 6.00 p.m.
Commercial Bank made facilities to applying a personal loan and placing a LKR and foreign currency fixed deposits by online banking. 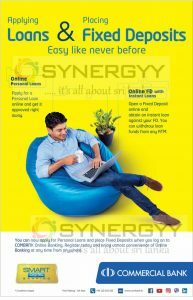 This online banking service will reduce time and unnecessary paper works for you and bank and this service will help you to do fund transfer within commercial bank for free and fund transfer with other bank accounts at an nominal fee of Rs.50. and this online banking will be charge nominal annual fee. Vallible Finance Company announces a special interest rates upto 14.10% per annum at maturity and 13.87% (AER) for the 15 month fixed deposits for the senior citizens of Sri Lanka. Vallible Finance is licensed finance company by Central Bank of Sri Lanka provides a better interest rates for the short to long term fixed deposits made by senior citizen. Sanasa Development Bank PLC announces a highest Interest rate for saving account as 10% interest per annum (10.46% AER) . 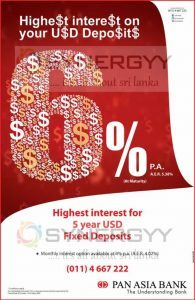 This interest rate is highest offering interest rate for a saving account in Sri Lanka Banking Sector. The offer comes along with a Sanasa Development Bank 20th anniversary to the SDB Top Saver Account with unlimited withdrawals. 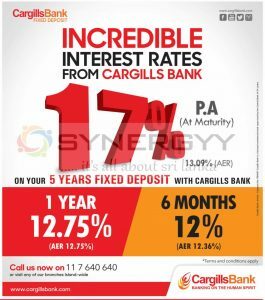 Cargills Bank brought you a special fixed deposits interest rate for 6 month and 1 year, the fixed deposit of the best way to maintain the value of money against the inflation and devaluation of Rupees. Enjoy a highest interest income for the 6 month and 1 year fixed deposits from Pan Asia Bank. 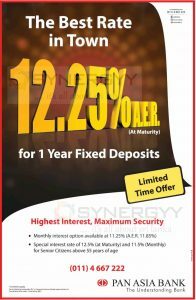 Pan Asia Bank offers 12.25 % for one year fixed deposits at Maturity and 12% interest rate for 6 month fixed deposits at maturity. All the Interest income will be liable to Withholding tax of 5% so effective interest rate would be . Assume made Fixed Deposits of 100,000/- for 1 Year. Assume made Fixed Deposits of 100,000/- for 6 Month. Pan Asia Bank announces a special Interest rate for USD Fixed Deposits of 6% at Maturity for the 5 Year Fixed Deposits of Minimum USD 25,000. And Bank offers 4% Per Annum for monthly interest option for the same amount above. Commercial Bank offers fixed deposits for 1 Month to 60 Month Period with an interest rate start from 8.5% to 12.50% per annum. Fixed Deposits is one of the best investment method if you unable to spend time on business operation or not willing to take a risk of CSE. And many banks and financial institutions offer better fixed deposits interest rate depend on their profile and the money needs of their operations. 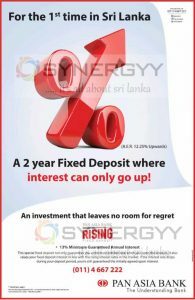 Always in Sri Lanka Finance Institutions is offer higher interest rate for fixed deposits than Commercial banks, where the attention towards to finance company is less in public compare to Banks especially in Sri Lanka, so finance institutions offer higher interest rate to accommodate their lending service. Again it is public responsibility to select the correct Finance institution or banks to deposits their money and safe guard their deposits. As I started banking with commercial bank, I am still do maintain my banking services with commercial, but many of the people doesn’t know commercial bank offers Higher interest rate for Online Banking Fixed deposits than the fixed deposits open in Branches. May be its t encourage people to use more online banking, but it is advisable to use the online banking and maximise your returns. For more details Click here to See the Normal Fixed Deposits interest Rate and check with Bank for Online Banking Fixed Deposits rate. 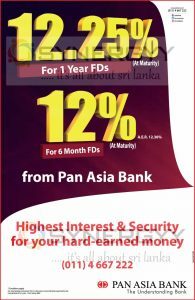 Pan Asia Bank introduces a new fixed deposit which guaranteed annual interest rate of 13% and when the interest rate rising in the market you will getting higher interest earning and if interest rate drop on your investment period bank will sill provides you minimum of 13% as agreed. This special Rising Fixed Deposits are 2 Year fixed deposits and 13% Minimum Guaranteed Annual Interest (A.E.R. 12.25% Upwards). This special fixed deposit not only guarantees you a minimum interest rate when you open the account, it also raises your fixed deposit interest in line with the rising interest rates in the market. If the interest rate drops during your deposit period, you’re still guaranteed the initially agreed upon interest. Pan Asia Bank PLC announces a special fixed deposits interest rate for the 12 months fixed deposits as 12.25% on Annual Effective rate at Maturity. The offer is highest interest rate from the banking industry where the fixed deposits interest rate for 12 months from 9% to 11% as maximum, therefore this deposits would gain you more of 1.25% for your fixed deposits for 12 Month. If you rate a senior citizen above 55 years of age you will get special interest rate of 12.5% (at Maturity) and 11.5% (Monthly. Citizens Development Business Finance PLC Brought you range of gifts for the fixed deposits made during the Sinhala Tamil New Year Seasons. 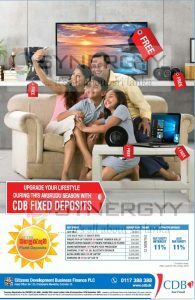 Upgrade your lifestyle during this avurudu season with Fixed Deposits at CDB. 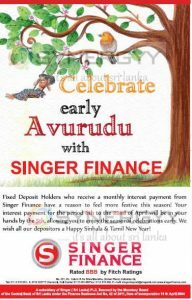 Fixed Deposit Holders who receive a monthly interest payment from Singer Finance have a reason to feel more festive this season! Your interest payment for the period 6th to the 22nd of April will be in your hands by the 5th, allowing you to enjoy the seasonal celebrations early. We wish all our depositors a Happy Sinhala & Tamil New Year! 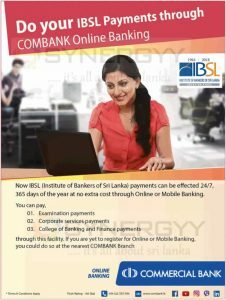 Now IBSL (Institute of Bankers of Sri Lanka) payments can be effected 24/7, 365 days of the year at no extra cost through Online or Mobile Banking. 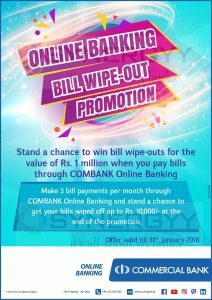 Make 3 bill payments per month through COMBANK Online Banking and stand a chance to get your bills wiped off up to Rs. 10,000/- at the end of the promotion. The National Development Bank PLC launched a new generation of Cash Recycling Machines (CRM), of which the maiden CRM was deployed at Hemas Hospitals, Wattala. This CRM offers you serval new features on the standard ATMs. Cash recycle machine is complex machine that handle simple, but important task of accepting and dispensing cash. And this CRM is enabling to cash deposits which are credited to the customer’s current or saving account on real time. Bank of Ceylon offers a Ran Kekulu Account with an initial deposit of Rs. 250/- to little ones entering the first year of school or preschool along with a drawing kit consisting of books and crayons. Children who have a Ran Kekulu Account and are entering Year 1 will also get these gifts. DFCC Bank brought you range of gifts for this season and offer you the highest interest rate for saving and spin the wheel of fortune and win amazing gifts. Sampath Bank brought you latest technology and eco-friendly system of slip-less banking methods for deposits and withdrawals to Sri Lanka. It is the first time in Sri Lanka Banking industry to follow slip-less banking. Now you can deposit and withdraw money without the hassle of filling slips. For those who register for both Slip-less banking and Sampath Vishwa before 31st March 2018, the first year annual fee for Sampath Vishwa will be waived off from Sampath Bank. Be a part of the Slip-less Revolution and gain more benefits and be eco-friendly. 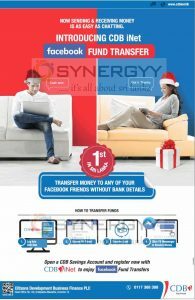 Citizen Development Business Finance PLC announces a special facility of transfer funds to your facebook friends without bank details. This is the first time in Sri Lanka offer such a service by finance company. 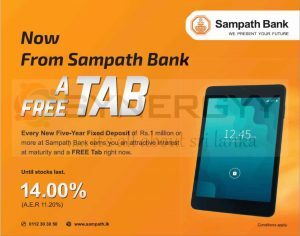 Sampath Bank announces a special promotion for 2018 as get a FREE Tab for every new five year fixed deposit of Rs.1 million or more at sampath bank earns you an attractive interest at maturity and a FREE Tab right now. Sampath Bank offers you a special interest rate of 14% (A.E.R of 11.20%) for the 5 year deposits. *Offer valid till stocks last. 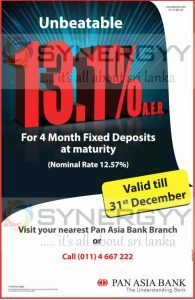 Pan Asia Bank announces that they offer unbeatable interest rate of 13.1% A.E.R for 4 month fixed deposits at maturity. if you own a Sampath Double S Saving Account at Sampath Bank, the bank offers you a bonus interest every month other than your monthly interest for your saving. This scheme is only available in Sampath Bank in Sri Lanka. In the same time other banks also offer bonus interest for their saving account but some bank do have requirement of minimum account maintain of Rs. 25000/- to Rs.50,000/-. 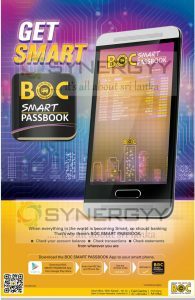 Download the BOC Smart Passbook App to your smart phone from Google play store, follow the simple steps to open your smart banking. Bank of Ceylon Announces that every new baby, born between 1st August to 31st December 2017, will receive a Ran Kekulu account or ATHFAL account with an Initial Deposit of Rs. 250/-from Bank of Ceylon. Visit your nearest BOC branch within three months of your child’s birth and get your child a Ran Kekulu account or ATHFAL account, full of benefits. 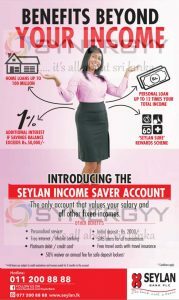 Seylan Bank announces you will benefits beyond your income, if you obtained a Seylan Income Saver Account.